This should have been blogged a month ago, whoopsie! But, better late than never. I had to share these two sweet souls. 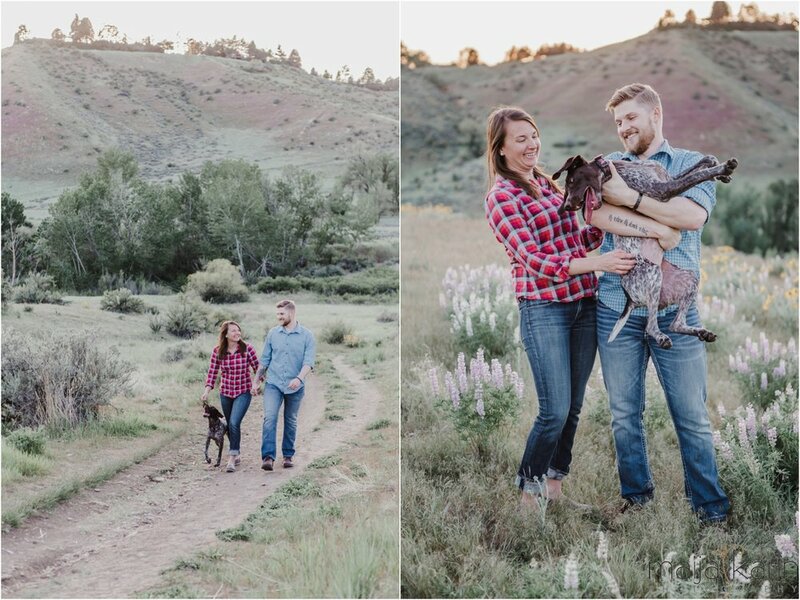 Michele and Doug met me out at the Military Reserve in the Boise Foothills toward the beginning of May and it couldn't have been a more gorgeous day!! Michele scouted out a sweet spot on one of her runs with her pup. I love when couples find spots that make them happy and seem like the perfect backdrop to represent who they are. This area of the Military Reserve was such a beautiful backdrop for their engagement session. The sun was just starting to set and the sky was clear and cloudless. The views were amazing! Not to mention, the fields of flowers stretched out with such a great punch of spring color. I had so much fun during this engagement session. We laughed, we played games, we wrangled their pup Arya, and we had an all-around blast. I'm so looking forward to being their wedding photographer at their upcoming November 10th, 2018 wedding! !